The art thieves of the world are poised for action! The Barnes Foundation’s $25 BILLION art collection is moving! The works of art; 181 Renoirs, 69 Cezannes, and 59 Matisses, along with works of Monet, Degas, Seuret, Titian and Picasso with many, many other artifacts are being transported from Dr. Albert C. Barnes’ private mansion/museum, located in a quiet suburban town outside Philadelphia, to the heart of Philadelphia’s downtown museum complex. The convoys of trucks will be rollin’ down Philadelphia’s expressways and via short cuts through sketchy neighborhoods. The FBI has been called in and cloak and dagger tactics are being taken with police escorts and double-bluffs with some convoy trucks heavily guarded carrying only one painting, others loaded to the brim with anti-hijack security systems. Not since World War II, when governments moved their collections from the museums to prevent their destruction, have we seen the magnitude of a move like this. Dr. Barnes, 1872-1951, born to a working class family, grew up in Philadelphia, made his fortune in the pharmaceutical industry, and became passionate about bringing art to the underprivileged. He began his collections of Impressionist artists long before they were recognized as masterpieces. Now these masterpieces will be displayed just as Dr. Barnes desired, in their own brand new museum, The Barnes at Philadelphia. Watch this video of the intriguing mystery surrounding the move of the Barnes Collection. And the collection…Wow! Works by American giants, from Benjamin West and Georgia O’Keefe, to Jim Dine and Joan Mitchell, are brought to a region that has until now had little opportunity to view the glories of America’s artistic heritage. 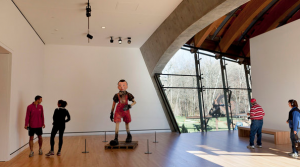 The Crystal Bridges Museum will very possibly be a place of pilgrimage for art lovers from around the world. A graceful, small museum, reserved for experiencing just ONE great artist’s work has just opened in downtown Denver! Clyfford Still, 1904-1980, was a notoriously cantankerous and private artist who kept almost every piece of art he ever made; paintings on canvas (825), works on paper (1,575) and sculptures (3). He still is renowned for lighting the fuse for the movement of Abstract Expressionism…a movement of hugely scaled style with no recognizable subject matter. 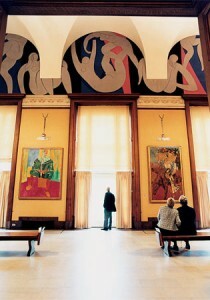 Jackson Pollock, Mark Rothko, Willem de Kooning, and Barnett Newman followed his lead a few years later. Still’s will stipulated that his estate be bequeathed to an American city that would build a museum exclusively for these works of art. None of the works could be sold, or given, or exchanged for funds. And Denver did it!! The private community raised $47 million with NO taxes levied! The result is an exquisite and light-filled space for this marvelous artist. Ms. Walton has been criticized for spending her fortune on the Crystal Bridges Museum instead of other social causes. Some critics think that the museum is not money well spent compared to other issues, but I think that they need to look closer at what is being projected here. Ms. Walton provides such masterpieces for the pure enjoyment of the entire community, as opposed to keeping or selling the pieces for private showing. The whole undertaking in itself has provided jobs for local workers while mostly using local materials and supplies, all the while promoting tourism and exclusivity to the town of Bentonville. Ms. Walton has presented a free of charge environment for people of the community to revel in such art that normally would not be available for viewing without her initiative. Every blog you manage to open doors to such a wealth of information. I have learned so much from your entries and I find myself carry them in my thoughts throughout the week. For example, I have never thought about the transporting of these treasures through a major city. I will be making my plans for a trip to Pa. to view the Barnes collection in a new location. I understand the museum is going to duplicate the arrangement from the original Barnes collection. The Crystal Bridges Museum looks beautiful. Why are there always people ready to criticize money for the arts? Is it really just entertainment or does it open our history and define creativity to the masses, thue encouraging more thought and more creativity. 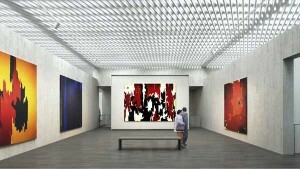 As far as, Clyfford Still, I have seen his paintings, but did not know a lot about him. Once again you have cast a light on him. Is he a self taught outsider artist? Kirby, thank you for so very much taking the time to put this together allowing us into your vast amount of research and personal info. Keep opening those doors! To which museum shall we go first?! Wish a handful of adventurers could go on an extended tour of all three. Anybody interested? Wonderful, Kirby. Soooooo informative! I’ll pass it on. I got what you intend, thankyou for putting up.Woh I am glad to find this website through google. “Food is the most primitive form of comfort.” by Sheila Graham. Thank you for sharing your knowledge and love of art and the world we live in. I look forward to your Blogs and watch them over and over. You are an exceptional artist and a very special lady. I miss you!